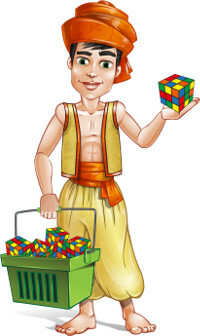 However, there are a lot of different cubes and most of them can be used in Rubik’s Cube competitions. These cubes differ in quality and price. Paying more does not always mean buying a better cube. So, which cube should I buy? The best cubes are those made by DaYan. These cubes are the ones that turns more smoothly, and are the cubes most used in Rubik’s cube competitions. For example, Mats Valk beat the Rubik’s Cube record with a DaYan ZhanChi, solving the cube in only 5.55 seconds. They have good-quality vinyl stickers, so you may never need to change them. And its price? It’s even cheaper than Rubik’s brand cubes. If you are a beginner or a professional, a DaYan cube is the best cube for you. You can choose DaYan GuHong or DaYan ZhanChi, both are very high-quality cubes, but there are more people that prefer DaYan ZhanChi. If you choose to buy the “colored” version (without stickers), you should know that you won’t be able to use that cube in an official Rubik’s Cube competition. Where can I buy a DaYan Cube? You won’t find these cubes in physical stores, but you can buy them online. You have 2 options. I normally buy in LighTake shop, as I have never had any problem (and I have bought there many times) and they have free shipping worldwide (doesn’t matter what you buy). You can also buy these cubes in Amazon (however, sometimes the prices are higher than in LighTake). The DaYan ZhanChi cube, the most popular model of these professional cubes, costs around 11 dollars. You don’t have to add any shipping costs, so it has a very affordable price for the best cube. I don’t want to compete, which cube should I buy? A DaYan cube. They turn smoothly, have very good quality, and they are even cheaper than those of Rubik’s brand.